A moisture management finish that works as hard as you do – without showing it. WICKING WINDOWS™ technology brings you new possibilities in moisture management with performance that beats the strongest competition in the market. Go from a tough workout to the store, or even coffee with friends, while staying dry, comfortable and looking fresh. What other technology or fiber can say that? So don’t sweat it – managing moisture and looking good has never been so easy. WHAT IS WICKING WINDOWS™ TECHNOLOGY? 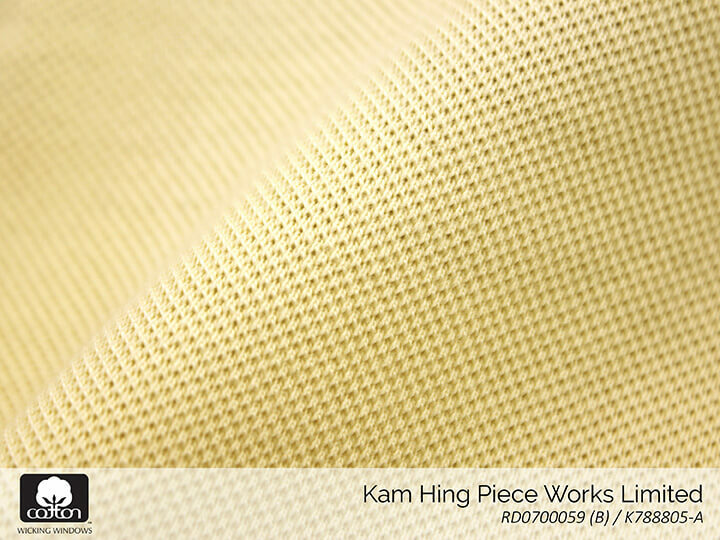 The WICKING WINDOWS™ technology is a unique moisture management application for cotton that helps eliminate the feeling of wet, saturated fabric against the body. This performance technology, developed by Cotton Incorporated, forces the transfer of moisture away from the skin to the outside of the fabric where it can evaporate — keeping you cooler, drier and more comfortable during exercise, errands, or wherever the day takes you. The WICKING WINDOWS™ technology is applied through the print application of chemistry to create repellent areas, producing “windows” or an allover print. The print pattern is colorless and can only be seen once moisture comes into contact with the fabric. WICKING WINDOWS™ technology offers three variations for a wide range of performance. The technology allows moisture to move to the outside of the garment through a single print process on the inside of the fabric. By using a double print process, the WICKING WINDOWS™ technology offers sweat-hiding properties coupled with moisture management. Finally, a phase change material (PCM) can be incorporated into the WICKING WINDOWS™ print paste to provide temperature regulation and additional cooling properties. The best thing is, all of these variations last the life of the garment. 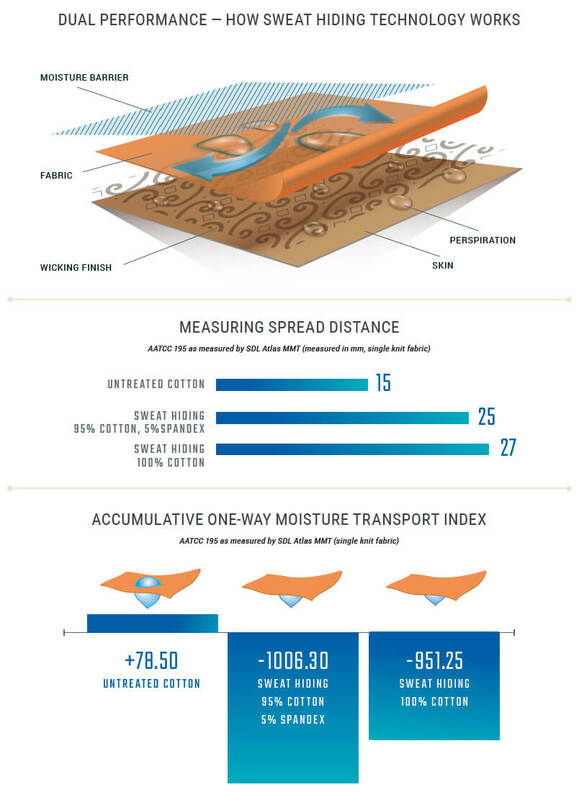 The possibilities and benefits are endless with this versatile, moisture management solution. 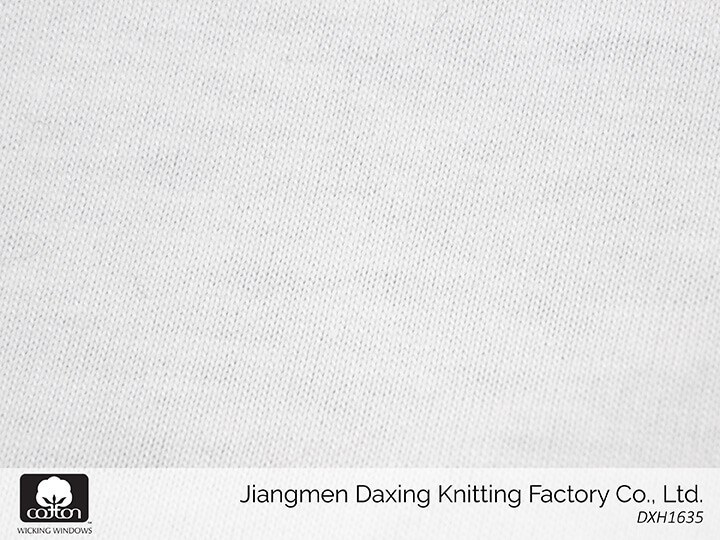 The WICKING WINDOWS™ technology is printed on the skin-facing side of the fabric. As the wearer begins to sweat, the printed areas remain dry against the skin while small absorbent “windows” pull moisture to the outside of the fabric where it can evaporate and dry quickly. The print pattern can be a simple coverage effect or can incorporate a stylized design, which adds a greater level of versatility to the functional performance. During exercise, fabrics can become saturated and cling to the skin, causing irritation and chafing. The WICKING WINDOWS™ technology greatly reduces the amount of cling force by minimizing the amount of wet fabric that comes into contact with the skin. 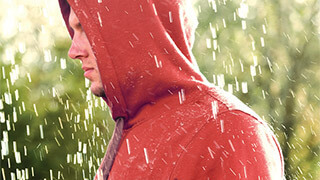 Less wet fabric against the skin means a drier, more comfortable experience. Many synthetic fabrics claim to move moisture away from the body to the garment’s outer layer, however most do nothing more than absorb water within the fabric structure. 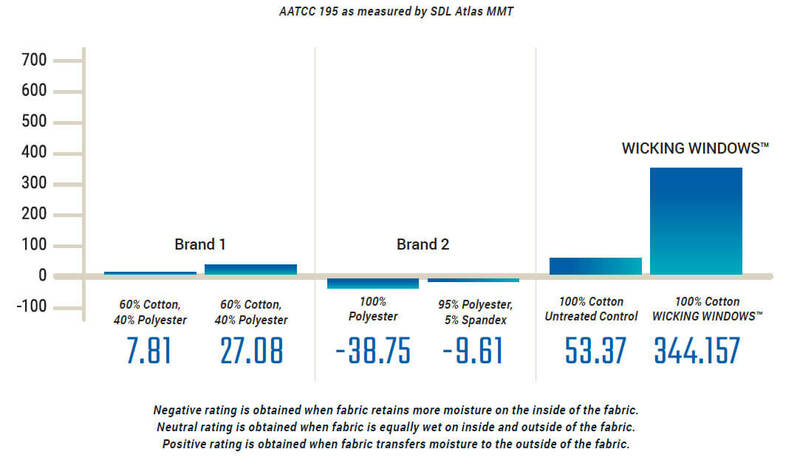 Fabrics treated with the WICKING WINDOWS™ technology have the ability to move moisture away from the skin better than most performance fabrics and exhibit significant performance advantages over untreated cotton, cotton blends and synthetic fabrics. 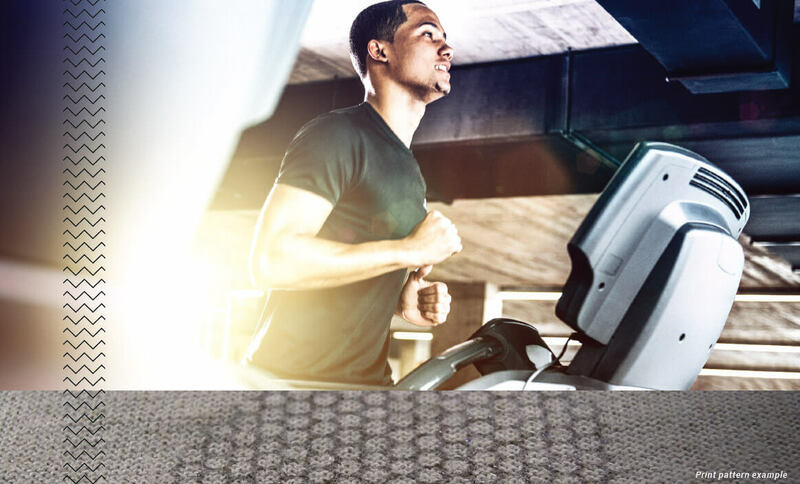 The WICKING WINDOWS™ print application not only helps move moisture to the outside of the fabric, preventing cling and improving dry time, but the technology and process can also be applied to prevent sweat marks from showing during or after a workout. The Sweat Hiding Technology is a multifunctional innovation for cotton that wicks sweat from the skin and keeps unwanted sweat marks from showing. The dual application process prints a high-performance wicking finish on the inside of the fabric and a breathable moisture barrier on the outside. The inside of the fabric absorbs and spreads moisture to enhance comfort and reduce fabric cling, while the outside creates a breathable barrier to prevent sweat marks from showing through. WORK HARD. KEEP YOUR COOL. The WICKING WINDOWS™ technology provides moisture management benefits by reducing fabric cling and moving moisture to the outside of a garment for a more comfortable workout. Combined with a cooling phase change material (PCM), the technology can also keep the wearer cooler as the temperature heats up and workouts get harder. A phase change material absorbs energy (heat) to regulate the body temperature as the external temperature rises. A microencapsulated PCM makes it easy to integrate this technology with the WICKING WINDOWS™ print paste and last the life of the garment. The unique combination keeps the wearer cool in warmer environments and still provides moisture management benefits. When exposed to heat and moisture, the WICKING WINDOWS™ + cooling PCM successfully keeps the fabric at least five degrees cooler than an untreated cotton fabric during application. 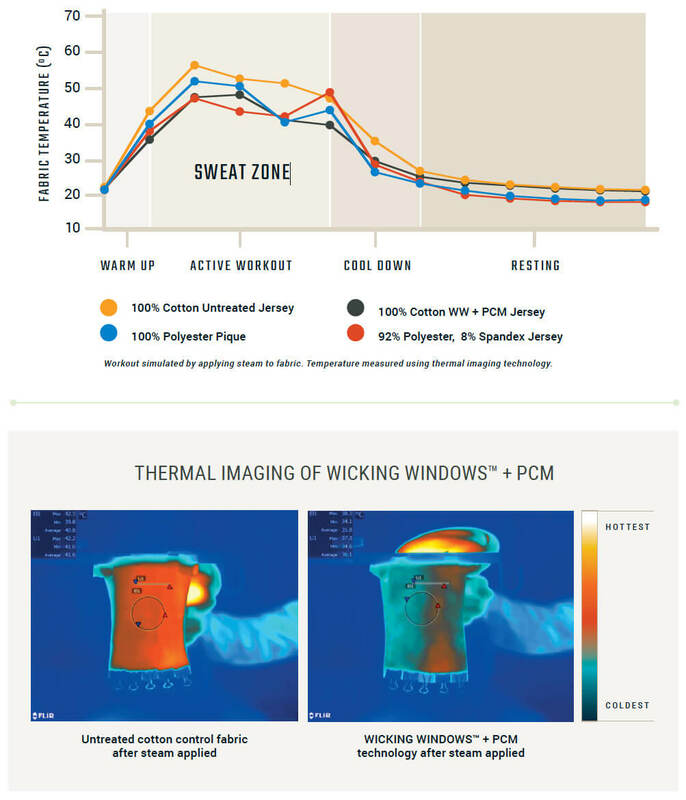 Thermal imaging tests show the treated fabric is not only significantly cooler, but it was also performed as good as or better than competitive synthetic phase change fabrics. Here are a few examples of WICKING WINDOWS™ technology from Cotton Incorporated’s licensed suppliers. These are just a sampling of constructions, designs, and fabrics that can be developed for your supply chain. 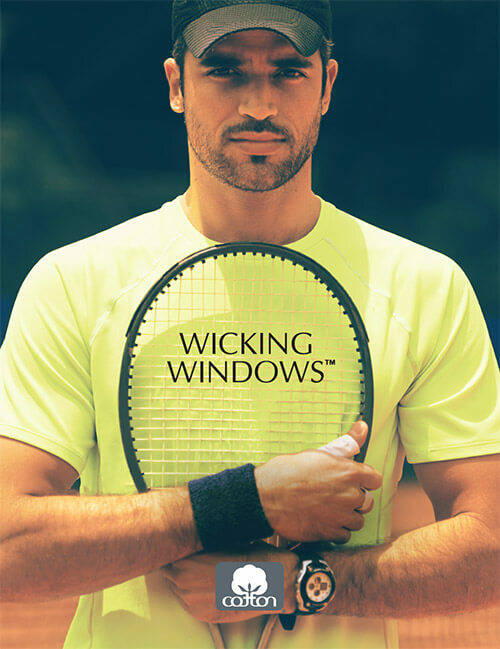 The WICKING WINDOWS™ technology has been adopted by major brands and is commercially available through 30 leading manufacturers around the globe. Contact one of these suppliers to implement WICKING WINDOWS™ in your performance apparel line.